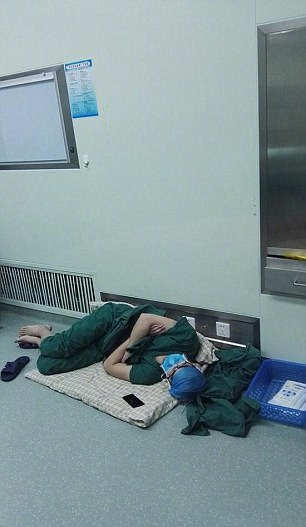 A surgeon in China has been pictured sleeping on the floor after pulling a brutal 28-hour shift. It’s a rare and beautiful thing to love the job that you do – especially to the point where you’re willing to risk your own health for your work. 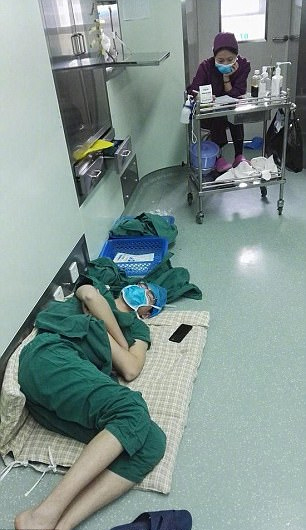 Once Surgeon Luo Heng’s 28-hour day was over he was pictured taking a well deserved nap on the floor, this is according to the People’s Daily Online’s social media account. The pictures were taken on March 30, and show a clearly pooped out Heng who is stationed at a hospital in Dingyuan County, in China’s Anhui province. Before taking his well deserved rest he performed two surgeries in the night and another three in the morning. People on the Chinese social media site, Wiebo both praised Heng for his dedication and voiced their concerns over his health. Numerous users saluted the exhausted surgeon, pointing out the somewhat obvious fact he had ‘worked hard’. According to Scientific American, the human body can go 264 hours (about 11 days) without need for sleep, although we wouldn’t advise it. However for most normal workers an eight hour shift is the standard recommendation.